Had a fantastic trip over in Bimini last weekend with multiple double headers and quality fish coming over the rail. Weather wasn't too bad so was able to make a video of our trip, turned out pretty well. Let me know what you think, tried to keep it short! I don't comment on a lot of video's because I think most of them are pretty bad but you edited the entire video perfectly. Different angles, lots of smiles, good fish and you didn't use "hard rock" like most people do.. why, I have no idea. You also get bonus points for letting your girl gaff the fish. I give the whole thing an "A". PS, the last shot, leaving the Go Pro in the cooler and shutting the lid... great way to end it. 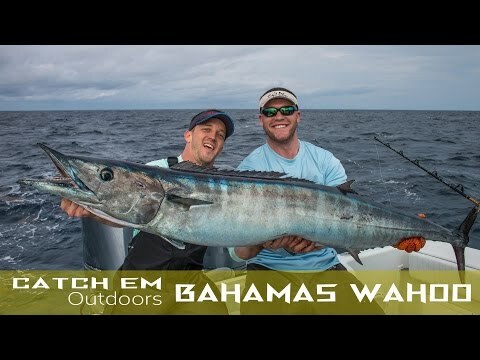 Great job on the the video and the catch!!! Ditto, Like the previous posts, excellent video, great harvest, congratulations. High speed wahoo trolling is more like commercial havesting than fishing....never stop the boat and drag lures fast on virtually unbreakable cables. Like commercial gill netting, speargunning and other highly effective forms of harvesting that were eventually Bahamian banned.....do we want to continue this ? It looks like alot of fun, but if we do, how long it will last ? I love fishing as much as anyone else, just something for all of us to think about -- Again great video editing, nice presentation, Congratulations. John. Are you sure you know what HST is and how difficult it is? How do u suggest to catch wahoo if u can't troll? I don't think FS would've featured this it it was anywhere close to unethical. Lol. I thought the video was awesome!!!! The whole gang was to return this weekend to hopefully make a repeat performance but of course dear mother nature had something to say. We'll all set to try in Feb. though to give it another shot. awesome job and video. You didn 't need to use any lead on your lines? in an effort to learn a lil bit, did you fish out front? just north off North Rock? or south a bit? CatchDog that is one fantastic and impressive video... I thoroughly enjoyed it! If you do not mind me asking is that Engel Cooler a 240 or a 320??? Thanks guys really appreciate the feedback! The beauty of the Ballyhood cowbell is that you don't have to use lead. We fish them with and without lead though to get them way down. J23ames - That is the Engel 320, we really love it, a must have for these extended trips. Great video and unbelievable action. :fishing Many on this forum need to watch and learn from your lady's gaffing technique, it was superb. Great video. Keep up the great work! Intrepid 370 - "My Favorite"
Awesome video! Nice work guys and especially gal!! Super rad video!!! Nice job on a pretty epic trip!! !